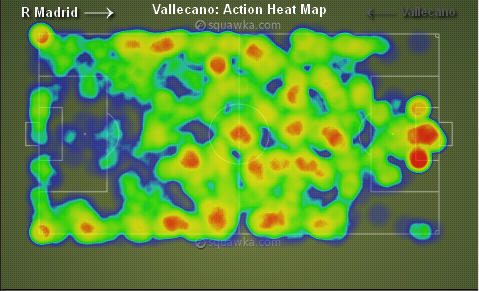 Real Madrid vs Rayo Vallecano – Perfect or Perfunctory? Following their midweek exertions in the Champions League, Madrid returned to domestic duty with a derby against Rayo Vallecano. Madrid entered this game confident of victory as you would expect when they play at home with comfortable home wins over Rayo in each of their last five meetings with 19 goals being scored in their favour. Arbeloa, Higuain and Modric were all suspended for this game but Mourinho was still able to surprise people with his line up. Morata began the game for his first league start with Benzema on the substitutes bench, where he would remain for the entire game. Depending upon your viewpoint, this was either a perfunctory win for Madrid or a perfect win given the prevailing circumstances such as injuries and suspensions. This game was much easier for Madrid than perhaps anticipated and even the dismissal of Sergio Ramos did not distract los blancos from the task in hand. A night of mixed emotion for Sergio Ramos. The defender was making his 250th La Liga appearance, scored a goal and collected the 16th red card of his career. There was something inevitable about the red card after Ramos was harshly cautioned for an innocuous foul on the halfway line in the 16th minute. Following his complaints, he attempted to block a cross from Rayo and with the ball striking his hand, he collected his second caution in just one minute. Kaka delivered another good performance in only his third La Liga start of the season. Again, his willingness to help out defensively was a bonus for Madrid as he won the ball for the opening goal before releasing Ozil on a diagonal run to cut back for Morata to open the scoring. The Madrid Midfield – Who Takes Control? Even prior to the dismissal of Ramos and the reduction of Madrid to 10 men, there was legitimate concern over how the midfield would function. With Essien and Khedira as the central pair and Kaka ahead of them, who would assist Madrid with the construction of play and retain possession? Or does that matter for the best counter attacking team in the world? Madrid completed 163 passes from just 227 attempts translating to 40% possession against a Rayo team comfortable on the ball but lacking penetration when they entered the final third. Madrid were never exposed in this game as Rayo offered little to trouble their defence or Diego Lopez in goal therefore should the inability to retain possession be a concern for Madrid or should the result be all that matters here? As ever, Madrid looked extremely dangerous during transitions but against Barcelona in the Copa del Rey and then Man Utd in the Champions League, adopting a similar position will not be sufficient as Madrid need to at least score in both games. If Man Utd were to consider a defensive position such as that adopted during the second half at the Bernabeu, Madrid could find their dream of la decima ending abruptly. It’s a difficult balancing act over the next few games prior to Man Utd. Alonso must be handled carefully to recuperate from his niggling injury whilst Modric need further game time to bed down at Madrid but with a double header against Barcelona on the horizon, what are the solutions? Would Mourinho rest players for the league match given the circumstances to ensure that players are fresh for the two games that really matter? Rayo – Dare to Believe? Faced with playing 10 men for 73 minutes and with those 10 men falling back into a 4-4-1 formation with two deep banks of four, Rayo should have offered something better in attack. In some situations though, it’s not a lack of technical quality which can adversely affect a team. It’s a lack of belief. Too few Rayo players believed that they could get something from the game even though they trailed 2-0 at this point. It’s a significant departure from their performance at home last week against Atleti when they seized control of the game. Baptistao was unable to become involved in the game sufficiently leaving “Chori” Dominguez with the bulk of attacking duties. The Argentinean is on a season loan from Valencia and performed well with two efforts had goal although he should have produced something better with his first attempt which went narrowly wide. Were Rayo so preoccupied with avoiding the concession of goals during transitions that they altered their own set up? Certainly in the first half, they seemed reluctant to produce their normal game. For Mourinho, it’s another league game out of the way and the Copa del Rey semi final and Champions League are a step closer. The red card for Ramos may present problems in the league but a suspension should ensure he remains fresh for the game at Old Trafford, the key game at this point of the season. A very disappointing performance from Rayo. The red card for Ramos presented an opportunity for Paco Jemez’s men that they never seized. Their away form remains very poor and will probably be the reason that they fail to secure a European berth at the end of the season. It’s now four wins and eight defeats in their twelve away games this season.